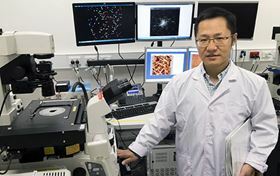 Qiaoliang Bao at Monash University has found that antimonene, a 2D material, has greater sensitivity than graphene for detecting DNA and microRNA associated with cancer. Photo: Monash University. Engineers at Monash University in Australia have unlocked the door to earlier detection of cancer with a world-first study identifying a potential new testing method that could save millions of lives. The engineers developed a sensor that utilizes new, more sensitive materials to look for key markers of disease in the body and found it could increase detection sensitivity by up to 10,000 times. Qiaoliang Bao, an associate professor in Monash University’s Department of Materials Science and Engineering, along with research colleagues at universities in China, found that antimonene, a 2D material that can be exfoliated from bulk antimony, has greater sensitivity than graphene for detecting DNA and microRNA associated with cancer. The study, described in a paper in Nature Communications, provides a significant advance in the detection of the biomarkers microRNA-21 and microRNA-155. These are found in many tumors that lead to pancreatic cancer, lung cancer, prostate cancer, colorectal cancer, triple-negative breast cancer and osteosarcoma. MicroRNA are small molecules that are emerging as ideal non-invasive biomarkers for applications in toxicology, diagnosis and treatment monitoring. Biomarkers have the potential to predict, diagnose and monitor diseases like cancer, but are difficult to detect. To produce such a new approach, the engineers developed a surface plasmon resonance (SPR) sensor using antimonene materials and performed a number of studies to detect microRNA-21 and microRNA-155. Their findings show that the sensor could achieve a detection limit of 10aM, up to 10,000 times better than existing microRNA sensors. According to Bao, this world-first study using antimonene materials for clinical advancement constitutes an opportunity for future research into the development of sensors and systems for early cancer diagnosis. “Antimonene has quickly attracted the attention of the scientific community because its physicochemical properties are superior to those of typical 2D materials like graphene and black phosphorous,” he said. The research was conducted through FLEET (The Australian Research Council Centre of Excellence in Future Low-Energy Electronics Technology) – a collaboration of more than 100 researchers at seven Australian universities and 13 Australian and international science organisations. It also involved researchers at Shenzhen University, Jilin University and Wuhan University in China. This story is adapted from material from Monash University, with editorial changes made by Materials Today. The views expressed in this article do not necessarily represent those of Elsevier. Link to original source. Log in to download the full text PDF for free. Read the first issue of Materials Discovery, free. Improved DNA detection using nanopore sensors.